Along with the Cathedral - Milan's most famous and much beloved monument - the big Castle is linked to the vicissitudes and dramatic events that the city has been experiencing over the past centuries. For many years, in fact, it has represented a symbol of the power in the hands of the Dukes, as well as of the foreign dominators. Only at the beginning of the 20th century the Castle assumed its distinctive role, becoming a place of culture, which hosted numerous Lombard art collections. 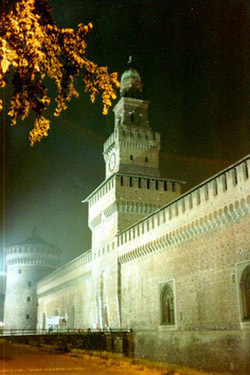 The Castle was named after Francesco Sforza, who transformed it into a ducal residence in 1450. Over the centuries, the castle has undergone various changes, also due to the particular ups and downs that have seriously affected the structure. At the end of the 19th century, a major renovation was made on the whole building. Castello Sforzesco is a majestic building. Inside it has wonderful interior courtyards, built in Gothic-Renaissance style and incredible halls, designed by Leonardo, and frescos painted by master painters such as Bramante, who were commissioned by the court of Ludovico il Moro. The Castle now hosts important art exhibitions.